Remember when “social studies” class was as dry as the chalk dust on the teacher’s fingers? Students sat through an explanation of the Teapot Dome scandal in September, only to be rewarded with the fireworks of the General Agreement on Tariff and Trade a few long months later. This semester at Hartford High School, five seniors actually look forward to social studies. That’s because they’re literally putting their town on the map — Google Earth style — in 3-D. When the bell rings in the halls of Hartford High School at 10:45, seniors Peter Crosby, Dan Devins, Brett Hausler, Drew Twitchell and Ben Wilson report to their class in room 107. At the front of the room is their teacher, Mike Hathorn, an intense, collegial guy with a crew cut who looks not much older than his students. 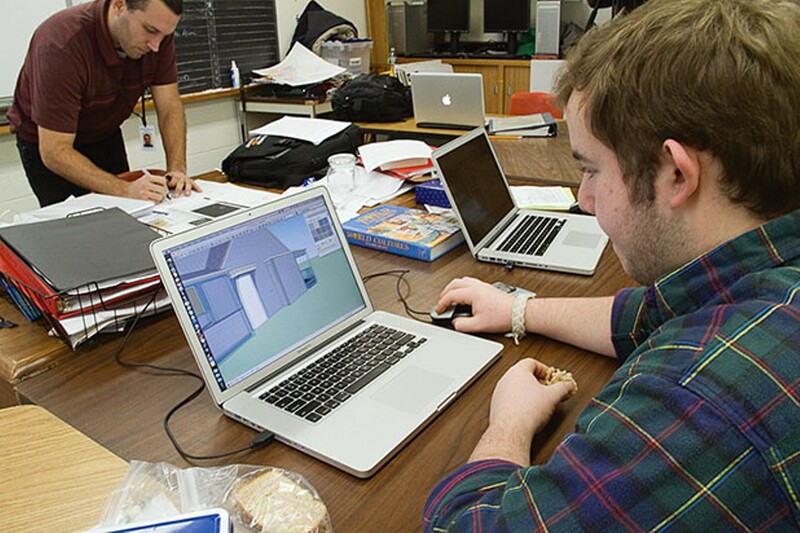 As the five young men get to work, they don’t take out notebooks or textbooks; instead they open MacBook Pros and toggle between Adobe Photoshop CS4 and Google Sketch-Up, a 3-D modeling application. Hathorn doesn’t teach so much as moderate, every so often trading sarcastic jabs with his students to keep them on task. The class, which began last year, is called “Creating Hartford,” and the students are doing just that: methodically recreating the buildings and street scenes of the historic district of White River Junction by using Google Sketch-Up, studying town records and histories, and interviewing town residents. When the students finish a building, they submit it to the Google warehouse, which reviews it before posting it on Google Earth. Thus far, all 40 of their buildings have been accepted, gaining the students acclaim from the Vermont legislature, which issued a resolution congratulating them on their work, and from Google itself, which donated nine refurbished Macs to the classroom. “It’s a significant achievement, getting their work through the Google machine,” says Matt Dunne, manager of community affairs for Google (and a Democratic candidate for governor). “Creating Hartford” is one of the best examples of the successful integration of technology and education in Vermont. But, in part because the state’s educational system is decentralized, such classes are few and far between. For now. Dan French, the superintendent of the Bennington-Rutland Supervisory Union, is trying to change that. He’s promoting technology in schools not by running up a tab with Dell or Microsoft, but by taking advantage of free open-source software and Google’s gratis “Apps for Education.” And he isn’t pushing these tech tools for their own sake, but because he believes they’re vital parts of “21st-century learning.” French is recognized as Vermont’s most influential leader when it comes to making technology work in concert with that latest buzz-phrase of progressive education. “Twenty-first-century learning”: The slightly new-agey term sounds good, but what does it mean? The definition encompasses yet more buzz-phrases, such as “student-centered learning” and “project-based instruction.” Proponents of 21st-century learning have also staked out some rather traditional skill sets, such as problem solving, collaboration, communication, and innovation and creativity. The funny thing about “21st-century learning” is that it’s been around at least since 1749, the year Benjamin Franklin published his “Proposal Relating to the Education of Youth in Pennsylvania.” Franklin, frustrated with the narrow-minded curricula of his day, yearned for an educational system that more closely matched the realities of colonial life. His ideal curriculum, nearly blasphemous at the time, included instruction in drawing, horticulture, science, civics, math and history. It denounced lecture-driven pedagogy in favor of student-based inquiry and a course of study valued for its utility in everyday pursuits. Franklin didn’t get to see his proposal come to fruition. He passed the mantle of progressive education to Burlington-born philosopher John Dewey, who advocated for more experiential learning in the early 1900s. After Dewey came Paolo Freire’s Pedagogy of the Oppressed and Ted Sizer, founder of the “essential schools” movement, who was known for his belief that teachers function best as mentors or coaches — not drill sergeants — to their students. French looks at 21st-century learning through a technological lens. He believes computers, software and integrated communication systems aren’t just delivery systems for knowledge; they’re tools students can use to apply knowledge in the real world, just as Franklin and Dewey hoped young Americans would do. For this kind of forward thinking, French was named the 2009 Superintendent of the Year by the Vermont Superintendents Association. 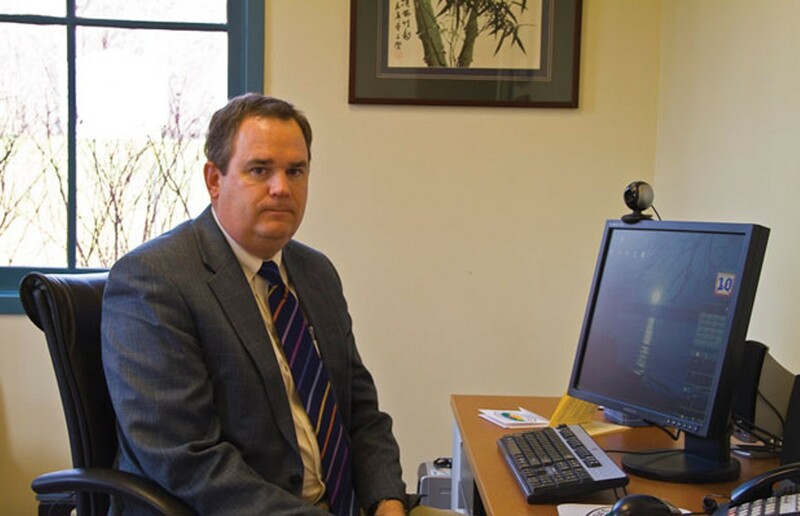 “Dan is constantly advocating for educators to rethink assumptions regarding the possibilities that exist to use technology to bring Vermont classrooms into the 21st century,” said VSA president John Everitt in a press release. As a superintendent, French can have a meaningful impact on the way schools use technology — and that’s a result of the unique structure of school administration in Vermont. Every school district is a member of a supervisory union, a sort of advisory board set up to support efficiency and share curricula. But the supervisory union itself has no authority over the running of schools. The real power lies in the hands of the superintendent, who’s the equivalent of the CEO of every school in the district. French, a 46-year-old from Connecticut, oversees his “subsidiaries” from a sedate office building in Sunderland, just across Route 7A from the toll road that leads to the summit of Mt. Equinox. He graduated from the University of Connecticut with a bachelor’s degree in Asian studies and then enlisted in the Army as a Korean linguist. Although French says he’s always been a technophile, his first introduction to the power of computers came while he was stationed in the Korean Demilitarized Zone, where he would intercept and unscramble communications from the North Korean military. When his time in the Army ended, French moved to Colebrook, N.H., to teach social studies. During that period he worked on his master’s degree at Plymouth State University. In 1997, he became the principal of the K-12 school in Canaan, a small town in the northeast corner of the Northeast Kingdom. Equipped with networking experience he gained in Colebrook, French connected the Canaan school, library and town offices with a T1 wide-area network, which is basically a broadband Internet connection shared by the town buildings and protected by a common firewall. A couple years after that, French, by then the superintendent of the Essex North Supervisory Union, got an offer in the mail for a Linux software package. Linux is a free operating system that has a reputation for being the software of choice for highly skilled computer users — those who prefer typing commands on a Stygian-black screen to using a popular interface such as Microsoft’s Windows or Apple’s OS. French redeemed the offer, but put it on the shelf for a while. Two years later, he finally found the time to play around with the software. Today he’s a self-avowed “Linux convert,” though he runs his work computers with the more user-friendly Ubuntu operating system. To get a better idea of Ubuntu’s draw, just imagine a free version of Windows XP and Office. The price point is one of the reasons French made the switch. The other, and more important, reason is that Ubuntu is an “open-source” program, which means its language can be modified and improved by millions of computer programmers around the world. With this decentralized R&D department working all the time, Ubuntu releases a new version of its software every six months, and it’s what most schools outside the United States use on a daily basis. French is trying to put Ubuntu in front of more students in Vermont — “they should be using the same tools the rest of the world is using,” he argues. But removing Microsoft from its deeply entrenched position in schools is no small task, even though the cost savings in software license fees would be substantial. French has taken one giant first step in the direction of free software by enrolling the BRSU schools in Google’s “Apps for Education” program. In the process, he has given the students a few powerful tools for communication and collaboration — and for taking 21st-century-style initiatives. Apps for Education is a group of software applications that operates in the “cloud,” or solely over the Internet, so there’s nothing to download. Some of the programs include Gmail, Google Docs, Google Calendar and Google Video for Education. According to Dunne, Apps for Education was first offered free to colleges and universities in 2007 as part of Google’s philanthropic work. French had just transferred to the BRSU and, perhaps unaware that Apps for Education wasn’t meant for K-12 schools, applied for the service. “It’s classic Vermont, right?” Dunne says. “Innovative and resourceful.” Google granted French’s application, and the BRSU became the first set of non-higher-education schools to enroll in the system, which includes free technical support and access to the applications via an Internet address with the school’s domain name. In March 2008, a Google representative met with Vermont educators to explore the possibility of offering Apps for Education to all the schools in the state, which would allow Google to test a large-scale deployment. The complete conversion never happened. At this point French, who has helped other supervisory unions switch to Apps for Education, estimates that about 20 percent of school districts are using the Google service. In a conference room at the BRSU headquarters, French wields a wireless keyboard and projects his computer screen onto an interactive whiteboard for a demonstration. He’s the top administrator of the system, so he controls how everyone can use the applications. Every student, teacher and administrative employee has a school email address and a home page with the widgets — mini-applications like weather, news and email — of his or her choice. French controls which widgets the students can use, and also who the students can contact via their school email address (French limits them to emailing other people in the district). Is he worried about students’ privacy being compromised when they run their data through Google’s servers? French brushes off the question. “I deal a lot with FUD: fear, uncertainty and doubt,” he says. “This is infinitely more secure than the other options.” And, he says, the pedagogical benefits gleaned from inexhaustible options for communication and teamwork more than offset any privacy concerns. What would a classroom look like if teachers and students used current technology to its fullest and most appropriate extent? Ed Barry, director of information technology services for the Milton Town School District, is working with the state’s education department on 61 scenarios that illustrate the vision. Their report is forthcoming, but Barry offers a sample to whet the appetite. The baseline is an average eighth-grade classroom where students use class notes, textbooks, library books and the Internet to write a report on the impact of global warming. The dream is far grander. The topic of the assignment is the same — global warming — but everything else is different. Instead of just writing a report, the students are members of a classroom team that collaborates with students in Canada, France, Japan and Australia in a minicompetition to create a plan that will reduce the carbon footprint of their respective towns. The class works with the local government to ensure the plan’s feasibility; it uses Skype to videoconference with researchers at universities around the world, as well as scientists in the green-technology industry, to find an appropriate renewable-energy source. The students interact with their colleagues on Second Life, an online virtual world, and create a video documentary of their project and post it on YouTube. Finally, with any luck, they secure a commitment from the local government to put the plan in motion. When the result could be something like “Creating Hartford,” a student-centered project that both educates its makers and serves the community, it’s easy to see his point. “The teachers are the biggest gatekeepers to technology in the classroom,” says Heather Chirtea, executive director of the Manchester-based Digital Wish, a nonprofit organization whose mission is to modify schools with current technology. Teachers throughout the U.S. can register on Digital Wish’s website and create a wish list of computers, digital cameras, video cameras and educational software. Then members of the public can choose to donate an item on that list directly, by buying it through the website and having it shipped to the teacher, or by donating the cash equivalent to the teacher’s account. Kirk Kardashian has been a Seven Days contributing writer since 2006. He's the author of Milk Money: Cash, Cows and the Death of the American Dairy Farm, published in 2012 by the University Press of New England. Strife Lesson: Has a Cop-Turned-Educator's Assault Case Taught Him Anything? jhilt123: Markport: who are the unethical criminals? Accusing someone of acting like a third-grader is pretty lame.